Water is something that we cannot deny our bodies. We need it in order to function. I could go on and on about the necessities of water and why we need it, but I'm pretty sure you know hydration is necessary. Hydration isn't only important in the summer. It's important year round. However, I will say that as the temperatures outside increase, keeping my body hydrated during runs becomes more challenging, to say the least. Of course, I'm training for a fall marathon which means running during the summer months is unavoidable. I could run inside on the treadmill - all summer long - but I really don't enjoy treadmill running that much. Note: I'm not saying I'm against treadmill running. I'm simply saying I prefer to run outside. 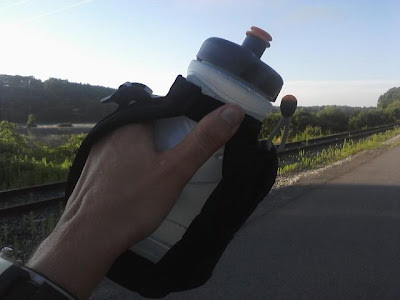 I never would have considered running with something in my hands until that super hot day and my final leg at Reach the Beach, when I ran with a plastic water bottle for the first 3 miles, then grabbed another one for the remaining 4 miles. It was during that run I decided that maybe I could run with something in my hands and be happy. Maybe. This is where Nathan stepped in to help me out with this challenge. I was sent a few items to review on my training runs this summer. First on deck is the Quick Shot. This little guy is so light (1.6 oz) and will hold up to 10 oz. = a grand total of 11.6 oz if you choose to fill it up. Not a lot of weight at all. I've been taking him out on several runs lately - mostly my 3 - 6 milers. I do like this one for the lightness and if I'm wearing something that has a spot for my keys, I definitely like to take this one. I also really like the race cap. There is no cap to pull up or push down. Not only is it incredibly light weight, it basically hangs onto my hand with zero effort. I really could run with my fingers straight out and the Quick Shot would not fall off. Next up is the Quick Draw Plus. Out of the three items I was sent, I'd have to say this one was my favorite. Again, this bottle is pretty light weight (4 oz) and will hold upto 22 oz. I have not filled it up entirely (yet). I've gone out on several mid length runs (5 & 6 milers) and it's been perfect for me. The pocket is a great feature and will hold a cell phone, keys, fuel and toilet paper. (yes, I've rolled up a wad of tp and brought it along) It's really amazing what I can cram into such small spaces. With this one, I did notice some "sloshing" sounds, but it wasn't really that bad at all. And when I was getting tired of it being on one hand, it is quite easily transferable to the other hand. The cap on the Quickdraw is one that needs to be pulled out before drinking. I did notice that after I drank some water, I had to push it in (with a quick slap of my palm) or I'd have water sprinkling on me. Which isn't necessarily a bad thing when the temps are rising. And up last is the Trail Mix belt. I had such high hopes for this belt. I was hoping it would provide me with the fuel and water I needed on my long runs. I was going to go for it and take it out on my 18 miler with Carrie a couple of weeks ago. I got it packed up, took a picture and even posted on facebook that I was going to take it out for the run. Then, my voice of reason (Ward) suggested I try it out on a shorter run first. He's so smart. What I like about this belt is that it has straps on the side to hold jackets/hats/etc if need be. I've been known to have to take layers off. It also has a huge pocket and then a smaller pocket in front of the larger pocket - leaving plenty of carry space. It also carries quite a bit of water - each flask holds 10 oz, giving you a grand total of 20 oz on this specific belt. And it is 100% hands free - well, until you need water. When you do need water, grabbing the water bottle and putting it back in are incredibly easy. I tried it out on a 6 miler with Izzy in the jogger. I put some snacks in the pocket for her and then gum for me. This pocket can hold a lot! Unfortunately, 4 miles into the run, I gave up running with it and tossed it in the basket of the jogger. I vowed to try it again. And I did, I went out for an 8 miler. I fiddled with it some more and then ended up taking it off and running with it in my hands. However, I must report that the Trail Mix is not for me. I took it out for 2 runs and ended up taking it off in the last 2 miles of each run because I couldn't handle it. Finding the right spot for the belt was the most difficult part for me. I tried for mid waist first and after stopping to adjust several times, it just moved around far too much. Then I tried it on my hips. This was better, but it still moved around and drove me crazy. I'm bummed it didn't work for me. I really had high hopes of spending my 20 milers with this belt. If you are in the market for hydration accessories, I'd definitely check out what Nathan has to offer. I am really enjoying the two handhelds I received. I think they both offer up a lightweight option for running and hydrating during the runs. They also come along with some other great features like the pouch on the Quickdraw and they both have the emergency ID cards. As you know, the belt wasn't for me, but it doesn't mean it isn't for you. If you are already a hydration belt lover and are in the market for another one, Nathan could be you place to go. I did like the amount of water the belt could hold, the ease of getting the flasks and returning them to their spaces and the amount of storage the pockets offered. You can visit Nathan at their online store to check out their products, like them on facebook or follow them on twitter. Disclaimer: Nathan provided me the products to try out, and I was under no obligation to review it if I so chose. Nor was I under any obligation to write a positive review for the product. Thanks for the reviews. I do have a 20 oz hand held but the pouch only can hold a key fob and 1 gu pack or the gu and my ID. I have yet to try a belt b/c I'm afraid it'd annoy me to no end. So happy you liked the reviews. How far have you run with your 20 oz? I've considered taking it on my long runs. I couldn't continue to wear my belt either - I did for a long time but had it cinched tight up around my actual waist which wasn't comfortable but was the only way that I could keep it from moving. Mine was by Amphipod - Now I use the quick shot by Nathan and love that! I rigged up a wrist band around it and now it has a big enough pocket for all of my needs. On long hot runs I refill it at regular stops along the way if I need to - Starbucks are super nice about giving out ice water! My husband has the quick shot and he really likes it. He loves the race cap. I use an Amphipod with the yellow bottles and I am used to it. 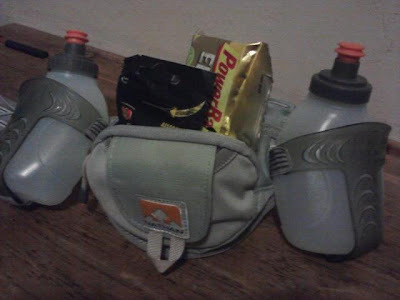 It can be heavy with four water bottles attached but I have to have my water when I need it. Thank you for the reviews! I just bought the Quickdraw, but haven't started using it yet. Would have had a much better race on Sunday with it though. Crazy MO heat is making it a necessary item. Glad you like it. I have the Quick Shot and really like it too. But it doesn't hold much so it's not practical for long runs. I do wish it had more storage for other things too. Is there a perfect belt out there? I'm still searching. Nothing stays in place and is more cumbersome than anything. I love the quick short but it IS so small. and at least IM FINNNNALLLLY hydrating. Great review! I just got myself a fuel belt not long ago! I still have to get used to the added weight and bounce though! I'm a Nathan fan as well! It can take a bit to get used to carrying something, but then you do get used to it and the convenience of it is SO worth it to have water at y our fingertips. Great reviews! I use the amphipod 20 oz handheld. I tried the amphipod belt too though. I could never get it right and would end up carrying it. I'm glad I'm not the only one. Hydration is so key right now. Love all these options. I just got a Camelbak and I love it! We both have the quick draw plus and they work pretty well. I still can't stand running with something in my hands though! I also have the trail mix belt and I am constantly pulling it down because I can't stand it to be where my natural waist is, but other than that I like it. I have the smaller handheld and the fuel belt from Nathan and really like both of them. Thanks for the review on all three!